Measuring your bed for custom made sheets is the most critical of measurements for bedding products. A fitted bottom sheet must fit a mattress in a certain way. The corners must be at the corners of the mattress (not off the side, or somewhere else along the edge), and the elastic we sew around the bottom must be tucked under the mattress itself. It is very important that you measure properly. Customer mis-measured custom made sheets are non-returnable. 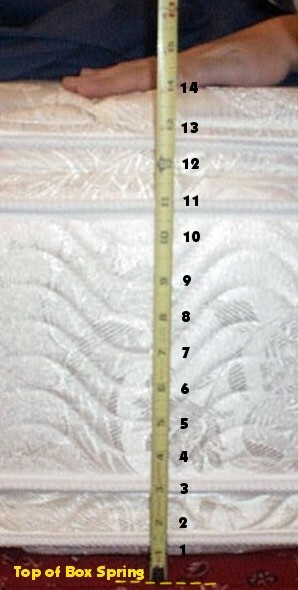 The first step in getting a custom sheet that fits, is to measure the length and width of your mattress. There is no legal requirement for mattress manufacturers to conform to "standard" sizes in making their beds. It could be a mistake to assume they stuck to standard sizes on your bed. The depth should not be measured from cord-to-cord. As you can see from the picture below, the bottom-most cord is above the box spring, and the top cord is below the upper loft of the mattress. As tempting as it may be to use the cord as a neat measuring point, you'll end up with sheets that don't fit. Instead, place the end of the tape measure on the top of the box spring, as shown here. Then place your hand on the top of the mattress and measure up to it. As you can see here, the depth of this mattress is 14". Remember to round off your depth to the nearest inch. Also, bear in mind that the sheets you order will actually about two inches deeper than the mattress measurement you give us. This is to provide enough return under the mattress. Remember our bottom fitted sheets have elastic sewn around the entire bottom, not just the corners. While these measurements are used to make the fitted bottom sheet fit properly, they are also carried over to the top sheet. If these dimensions aren't to your liking, you are welcome to request a specific set of top sheet finished dimensions by going to our "Custom-Made Sheets" page and ordering. Email or call us with specific questions on measuring.